By a three-to-one margin “Americans see news media journalists and broadcasters (45.4 percent to 15.7 percent) as mostly or somewhat liberal over mostly or somewhat conservative,” but for NPR and the New York Times recognition of a liberal tilt is closer to four-to-one. That ratio for the New York Times matches a July poll by Rasmussen (see below). Earlier NewsBusters posting on the Sacred Heart University poll. ....The perception is growing among Americans that the news media attempts to influence public opinion -- from 79.3% strongly or somewhat agreeing in 2003 to 87.6% in 2007. The most trusted national TV news organizations, for accurate reporting, in declining order included: Fox News (27.0%), CNN (14.6%), and NBC News (10.90%). These were followed by ABC News (7.0%), local news (6.9%), CBS News (6.8%) MSNBC (4.0%), PBS News (3.0%), CNBC (0.6%) and CBN (0.5%). 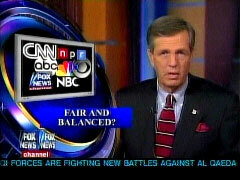 In 2003, CNN led Fox News on “trust most for accurate reporting” 23.8% to 14.6%. By two-to-one, 40 percent to 21 percent, Americans "believe the media is too liberal" over "too conservative," the just-released "National Leadership Index" poll by the Center for Public Leadership at Harvard University's John F. Kennedy School of Government, determined. Harvard's findings in the survey taken in September match a Gallup poll, also conducted in September, which found "more than twice as many Americans say the news media are too liberal (45%) rather than too conservative (18%)." In the Harvard poll, while 68 percent of Republicans said they think "the press is too liberal," 35 percent of independents agree and even 25 percent of Democrats consider the media to be too liberal, nearly as many as the 28 percent who see it as too conservative. The Harvard survey discovered widespread dissatisfaction with how the media are coving the presidential campaign as 64 percent "say they do not trust the news media's campaign coverage," 88 percent "somewhat or strongly agree that the news media focuses too much on trivial rather than important issues," 84 percent "believe the news media has too much influence on voters' decisions" and 83 percent think "large corporations have too much influence over what information the news media reports during the campaign." Many Americans do not believe the news media are fair, accurate or even moral, according to a new survey by the Pew Research Center for the People and the Press. The poll of 1500 Americans conducted late last month found that most of the public thinks news organizations are politically biased (55%) and often publish inaccurate stories (53%), and that roughly a third of the audience say the media are too critical of America (43%), hurt democracy (36%) and are immoral (32%). Half of Americans (52%) label the media as liberal, led by self-described Republicans (75%) but also large percentages of independents (49%) and even Democrats (37%). And while journalists tout themselves as the public's objective eyes and ears, many more Americans are confident that the military provides an accurate view of the war in Iraq (52%), compared with 42 percent who trust that the press offers accurate reports. Perhaps not surprisingly, Pew discovered that those who have chosen to bypass traditional news outlets in favor of the Internet give the "harshest indictments of the press." As highlighted by FNC's Brit Hume, a new Rasmussen Reports poll discovered that, by about two-to-one or greater, the public recognize a liberal bias over a conservative bias on ABC, CBS, CNN, NBC, NPR as well as in the New York Times and Washington Post. "By a 39 percent to 20 percent margin," a Friday summary of their survey relayed, "American adults believe that the three major broadcast networks deliver news with a bias in favor of liberals." The public perceive liberal bias by 33 percent to 16 percent for CNN and 27 percent to 14 percent for NPR. More believe FNC delivers the news with "neither" a bias in favor of liberals or conservatives than see ABC, CBS, CNN or NBC as unbiased: While 25 percent consider the broadcast networks to be without a slant, 32 percent think CNN is "without bias," but even more, 36 percent, say that about the Fox News Channel. On the newspaper side, Rasmussen learned than Americans see the Washington Post as liberal over conservative by about two-to-one (30 to 16 percent) while it's closer to four-to-one (40 to 11 percent) for the New York Times. "One of the more startling details," Rasmussen proposed, is that while liberals see all broadcast outlets and most newspapers as having a bias in favor of conservatives, even "25 percent of liberals see a liberal bias at the New York Times while only 17 percent see a conservative bias. This makes the New York Times the only media outlet that liberals are more likely to see as having a liberal bias than a conservative bias." The "vast majority of American voters believe media bias is alive and well" with 83 percent seeing bias in the media and of those, "nearly two-thirds (64 percent)...said the media leans left" while only "slightly more than a quarter of respondents (28 percent) said they see a conservative bias," determined a Zogby Interactive survey of 1,757 likely voters nationwide which was released on Wednesday. For many more polls on how the public perceive the media, as well as for the views held by journalists, check the MRC's "Media Bias Basics" section on the MRC's Web site.